Captain Rackamore and his crew do. It's their business to find the tiny, enigmatic worlds which have been hidden away, booby-trapped, surrounded with layers of protection—and to crack them open for the ancient relics and barely-remembered technologies inside. But while they ply their risky trade with integrity, not everyone is so scrupulous. Revenger is a science fiction adventure story set in the rubble of our solar system in the dark, distant future—a tale of space pirates, buried treasure and phantom weapons, of unspeakable hazards and single-minded heroism... and of vengeance. Fresh off of finishing the magnificently ambitious Poseidon's Children trilogy and collaborating with fellow science fiction superstar Stephen Baxter on the rather marvellous Medusa Chronicles, Alastair Reynolds returns with a stirring story about a pair of sisters who enlist on a spaceship and set about looting the rubble of a ruined universe. 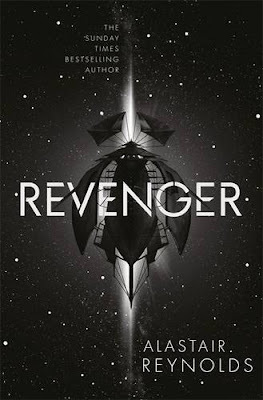 Featuring dollops of derring-do and not a few space battles too, Revenger might be Reynold's most accessible solo effort yet, but there's no dearth of darkness in this light-looking bite of a book. The universe has seen better days, I dare say. Aeons on from the forging, so many civilisations have risen and fallen that the current population of the Congregation live every day as if it's apt to be their last. Piracy is inevitably prevalent, but rather than stealing from one another, most pirates plunder the remnants of ancient races from the hundreds of thousands of dead worlds distributed in the distance. Most pirates, but not all. Not Bosa Sennen, who has carved out a terrible legend for herself in the blood and the bodies of those unfortunate enough to have found themselves near the nightmarish Nightjammer: a sneaky little spaceship with black sails, according to the tales, the better to board you before you know it. Pol Rackamore is one of the scant few souls to have come face to face with Bosa Sennen and survived, though not without paying a perilous price: the loss of his dear daughter. He'll see her again before Revenger is at an end, however—as will Adrana and Arafura Ness, the well-to-do young women at the centre of Reynolds' enticing text. When said sisters, so long under the thumb of their failed businessman of a father, hear that Captain Rack is hiring, they jump at the chance to crew the Monetta's Mourn for a couple of months. They hope to "go out, just for a while [...] then come back home, and share what we've made." (p.15) Needless to say, dear daddy doesn't agree, but then, he can't stop them, can he? I can't tell you what snapped in me, only that something did. It was like that last sob you give when you know you're done crying and it's time to dry your eyes and face the world. Maybe it was Adrana, on the other side of the glass, pressing her hand against it like she needed that last touch with her living kin. Or maybe it was just some stubborn survival instinct, one that told me I'd done enough heaving and bawling and feeling sorry for myself, and now was the time to act. Just as Arafura is transformed by Reynolds' narrative, Revenger itself is one sort of story to start and another come the conclusion. The first act is all adventure: a racy, rollicking read, enjoyable to any and all, not least because of the boldfaced boundaries between the good guys and the bad. The second, a more deliberate dive into the consequences of cruelty, has an edge, yes, but Revenger is all edge by the end. The last and longest act is as deep and dark as the catchcloth sails of Bosa Sennen's ship: it's never less than ambiguous, and often morally abhorrent. There are still a few shoot-outs, to be sure, but just who readers should be rooting for is no longer so obvious. But of course the glimmer dims. Chaos takes the reins. The glee with which Reynolds realises what is a surprisingly substantial setting for a seemingly standalone story gives way in the late game to something unutterably guttural. And that's Revenger to a T, really. It's exhilarating one minute, excruciating the next. There's a beauty to it, but an ugliness, also. It argues that innocence can be corrupted and even evil can be redeemed, and it does so with wit and weight. I wouldn't call it wonderful—it's far too nasty for that—but it is wicked. I just discovered your blog and I read it with great interest. Alastair Reynolds is certainly one of the best contemporary sci-fi authors. His Revelation Space series is impressive in terms of scope and quality of writing. I find, however, that he focuses more on world building than character development. Would you agree?